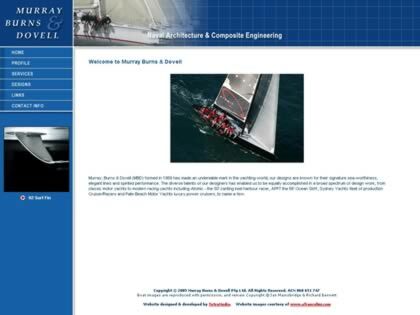 Murray Burns & Dovell Naval Architects and Composite Engineers located in Sydney, Australia. Designers of racing yachts, cruising yachts and traditional power yachts. Our designs won the 2001 Transpac Race Overall, 2001 Sydney to Hobart Race Overall, 2002 Pittwater to Coffs Harbour Race Overall, 2002 Sydney to Mooloolaba, 2002 Brisbane to Gladstone and many more. We have 16 production yachts currently being built including the popular Sydney 38 and design many custom yachts as well. Web Site Snapshot: If available, above is a snapshot of the Murray Burns & Dovell web site at http://www.murrayburnsdovell.com.au as it appeared when this site was added to the directory or last verified. Please Note that Boat Design Net has no involvement with the above web site; all content and images depicted in the above thumbnail are the property and copyright of Murray Burns & Dovell unless otherwise noted on that site. Description: Murray Burns & Dovell Naval Architects and Composite Engineers located in Sydney, Australia. Designers of racing yachts, cruising yachts and traditional power yachts. Our designs won the 2001 Transpac Race Overall, 2001 Sydney to Hobart Race Overall, 2002 Pittwater to Coffs Harbour Race Overall, 2002 Sydney to Mooloolaba, 2002 Brisbane to Gladstone and many more. We have 16 production yachts currently being built including the popular Sydney 38 and design many custom yachts as well.